The 7th Expeditionary Airborne Command and Control Squadron is part of the 379th Air Expeditionary Wing at Al Udeid Air Base, Qatar. It operates the E-8 Joint STARS aircraft, conducting airborne command and control missions. The 7th ferried lend-lease aircraft to Alaska for turnover to Soviets from, June 1942–March 1944. 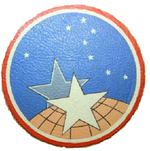 It conducted aerial transportation in the Southwest and Western Pacific from, 13 December 1944–September 1945. Reestablished in 1952 as a Headquarters. Air Force Logistics Command-controlled logistics squadron. Its mission was to provide worldwide airlift of nuclear weapons and related equipment, with a secondary mission to airlift other Department of Defense cargo as required when space was available. The squadron also provided airlift support during Cuban Missile Crisis from, 17 –28 October 1962. Inactivated in 1966. Became a Military Air Transport Service (later Military Airlift Command) C-124 Globemaster II strategic transport squadron flying worldwide airlift operations. Inactivated with retirement of C-124 in 1966. Reactivated in 1968 and performed Airborne Battlefield Command and Control (ABCCC) mission in Southeast Asia from, 1 March 1968 – 15 August 1973 and controlled airborne forces during the recovery of the SS Mayagüez in May 1975, in Grenada from, 23 October–21 November 1983, in Panama from, December 1989–January 1992, and in Southwest Asia from, 1 September 1990 – 16 March 1991. In 1994, the 7 ACCS was moved from Keesler AFB, Mississippi, to Offutt AFB, Nebraska where it transitioned from EC-130 aircraft flying the ABCCC mission to the EC-135 aircraft flying the Airborne Command Post (ABNCP) "Looking Glass" mission in support of nuclear command and control for United States Strategic Command. In October 1998, the "Looking Glass" mission was transferred to the Navy's E-6 fleet, the last of the US Air Force's EC-135 fleet was retired, and the 7 ACCS was inactivated. In March 2008, the unit was again reactivated - this time as the 7th Expeditionary Airborne Command and Control Squadron (7 EACCS) - to be the forward operating squadron for E-8 Joint STARS supporting the United States Central Command Area of Responsibility. 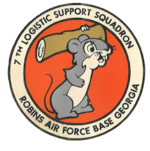 ^ This squadron is not related to the 7th Airlift Squadron, which was designated the 7th Air Transport Squadron, Heavy from 1 January 1965 to 8 January 1966, or to the 7th Air Transport Squadron (Transition Training Unit), which was organized by Military Air Transport Service at Great Falls Air Force Base, Montana on 1 June 48 and redesignated 1272d Transition Training Unit on 1 October 1948. ^ a b c d e f g h i j k l m Robertson, Patsy (March 1, 2017). 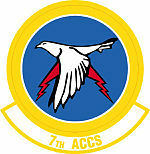 "Factsheet 7 Expeditionary Airborne Command and Control Squadron (ACC)". Air Force Historical Research Agency. Retrieved June 2, 2017.